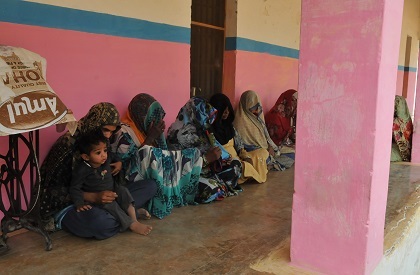 About a month ago, the jailer of Vidisha Jail RK Mihauriya, while noticing four children with the women inmates in the jail, suddenly realized that these kids might not have received immunization as required and received by other children out in the open. The publicity campaign related to Intensified Mission Indradhanush (IMI) for full immunization of children had caught his attention earlier. “I recognized that the four kids forced to stay in jail (with their mothers) were missing out with something that was surety of good health and long life for them,” Mihauriya said. So the jailer contacted the local field workers of health department to get the immunization done for the kids. But being told about systemic channels, the jailer decided to write to the chief medical and health officer (CMHO) of Vidisha Dr BL Arya. This instantly resolved the issue and when the third round of IMI commenced in the district on December 7, the CMHO sent out a team to the district jail to get immunization done for the four kids. Normally, four kids are not a big number in the huge target of total immunization under Mission Indradhanush. “But the small initiative taken by the jailer and the immediate positive response by the CMHO is an indication of the sensitiveness and prioritizing of IMI activities,” state immunization officer Dr Santosh Shukla says. Additional director general (ADG) Jails, Sanjay Chaudhary mentions that while there are all arrangements of health care including immunization available in jails either through doctors posted there or in coordination with local district hospitals, the initiative shown by Vidisha jailer, where facility of regular doctor was not available, was laudable. With concerted efforts of the health department, technical support of UNICEF Office of MP and bettered coordination with several other departments, immunization activities have gathered strength in 13 districts under IMI in state including Vidisha and Raisen. IMI has target of at least 90% full immunization in selected districts. Full immunization means vaccination of BCG, OPV 1,2,3, Pentavalent 1,2,3 and measles within one year of age. Focus on specific activities like house to house survey for headcount of left out and additional children, vaccine cold chain system optimization, communication planning and implementation, immunization session site activities, active tracking and mobilization of beneficiaries, monitoring and supervision with immediate corrective actions have helped the health department in giving steam to the campaign. The final round of the current IMI round would be held from January 7 with a target of achieving at least 90% full immunisaton in the 108 districts in 16 states, 52 districts in northeastern states and 17 urban areas. In MP, the districts include Tikamgarh, Chhatarpur, Sagar, Rewa, Raisen, Singrauli, Alirajpur, Jhabua, Vidisha, Sidhi, Panna, Shahdol, Sheopur and Indore urban.